A helciopter drops water on a small wildfire in the Knik River Valley, about 20 miles southeast of Palmer, on Tuesday, July 31, 2018. Wildland firefighters from the Alaska Division of Forestry are responding to a small wildfire in the Knik River Valley approximately 20 miles southeast of Palmer. The Friday Fire, estimated at three-tenths of an acre, was reported on the north side of the Knik River near Friday Creek late Monday night by residents on Knik River Road. The Mat-Su Area forestry office in Palmer has received several more reports of the fire today due to smoke visible from Knik River Road. A helicopter shuttled three firefighters to the fire at approximately 11 a.m. and also conducted several water bucket drops on the fire. Additional firefighters will be shuttled to the fire to assist with mop up operations. 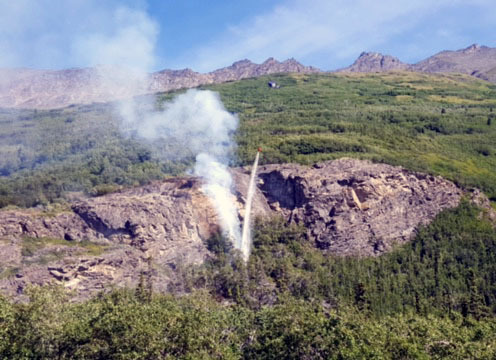 The fire is up against a cliff face and surrounded by rocks with little potential to spread, according to Mat-Su Area Assistant Fire Management Officer Phil Blydenburgh. The closest residence is about 4 miles away.